The Moto X is the talk of the phone world this week, thanks in no small part to those ads splashing across major American newspapers and a sign-up page popping up to boot. Today more details of the "design yourself" device have burst forth, reportedly outlining the customizable process by which consumers can create their own X phone, just the way they like it. According to sources speaking with ABC News, customers will be able to select the color of their device, plus engrave a name or message on the back, a la Apple iPods and iPads. The customization process will be done through a website, and consumers may even have the option to upload a photo for inclusion as a personalized default wall paper. The Android phone will be sold in standard variables at carrier stores, the report noted. A version running Android 4.2.2 is reportedly in network testing now, and Verizon is among the carriers checking it out. Some purported images of the back casing of the X Phone have also popped up on French site Nowhere Else today, appropriately highlighting the exterior of the device. We say appropriately because according to ABC News, the customization runs just below skin deep. Customers won't be able to choose the inner parts of their X Phone, though different storage options will be available. The sensors, as alluded to by Motorola CEO Dennis Woodside in May, are said to be where the real innovations lie. A flick on the phone will activate the camera, added voice capabilities are included thanks to parent company Google, and it will apparently even switch to speakerphone mode when it figures out its owner is driving. 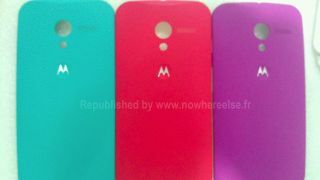 Motorola is making much of the fact that the X Phone, expected to launch by October, will be assembled in the U.S. It's a good marketing scheme, but it also reportedly serves a functional purpose: Being built on U.S. soil will allow customized phones to make it to American customers in a matter of days. We've yet to hear details on international availability, but this is sounding like a U.S.-only phone at least to start. We're still waiting on specs for the X Phone, but in its report, ABC News referred to the Moto X phone as a mid-range device. However, as Woodside put it, the handset is a hero device meant to take on the iPhone and Samsung's Galaxy line. Perhaps we'll see an option for high-, mid- and low-end X phones pop up further down the road? There are a few changes afoot with BlackBerry 10.2, according to a new leak. Check them out.